In Thailand, Kobkarn Suriyasat Wattanavrangkul ’83 was appointed minister of tourism and sports for Thailand. Daughter of 2003 Alumnae Achievement Award Winner Niramol Bulakul Suriyasat ’54 , Suriyastat Wattanavrangkul previously served as Chairperson of Thai Toshiba Industries Ltd., and is a member of the Wellesley College Business Leadership Council. Wattanavrangkul completed an art major while at Wellesley before going on to pursue an architecture degree at the Rhode Island School of Design. Wattannavrangkul is a supporter of community and social programs, and seeks to sponsor government initiatives to further the development of Thailand. 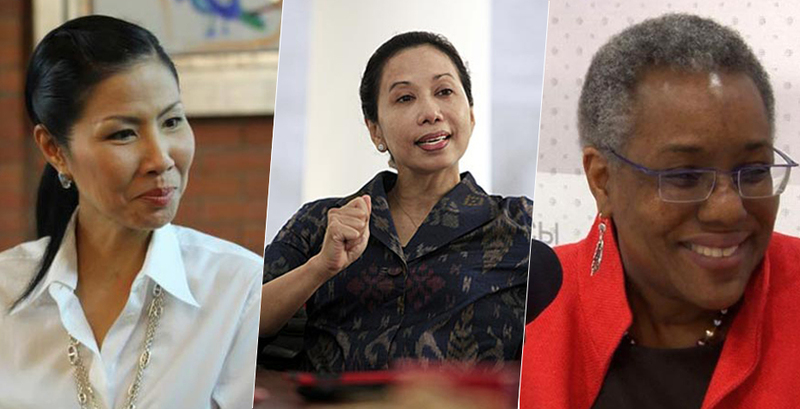 Meanwhile, Rini Soemarno ’80 was recently appointed minister of government enterprises of the Republic of Indonesia. Prior to this role, Soemarno served as commissioner for the Jakarta Stock Exchange, as minister of industry and trade for Indonesia’s Rainbow Cabinet, and was president director of PT Citra Motorindo Universe. A Wellesley economics major, Soemarno brings with her to the Cabinet a vast breadth of experience in banking and international trade, developed throughout her 30 years of work in Indonesian industry.Back stateside, Pamela L. Spratlen ’76 has been nominated to become U.S. Ambassador to Uzbekistan. Her nomination was approved by the Senate Foreign Relations Committee, but is still waiting for a final vote of approval from the Senate at large. A career diplomat, Spratlen currently serves as U.S. Ambassador to Kyrgyzstan, and following her confirmation, will continue her past work as a defender of human rights. Whether in Washington or abroad, Wellesley alumnae are leading in service on the world stage.